As a Tarot card, the Fool has one of the most unfortunate names! Fortunately, when you pull this card it doesn’t mean you’re a fool at all, in fact, it’s one of the best cards in the deck. The Fool card represents a new beginning, which can include a physical move into a new job or a new home. It could also mean a new lover/partner or you might start a new activity. Whatever it is, you’ve got a lot more to look forward to than just some new changes because the Fool represents renewal, movement and new beginnings. 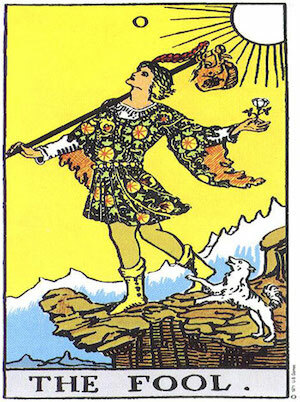 The Fool card shows him at the beginning of a new journey with unlimited possibilities. The sun rises up behind him, indicating the start of something new. He is facing North-west into the distance in the direction of the unknown. He carries a staff and a bag with all of his material belongings, but he has not yet opened the bag. Meanwhile, he has a white rose in his left hand representing purity and innocence. At his side is a little white dog, his guardian, who will protect him on his journey and will help him through times adversity. The Fool card is an exciting card to have in your Tarot spread. Let’s take an in depth look at what you can look forward to with him. The Fool Tarot card heralds new potential, fresh starts and your innocence or wonder of the world. It shows you that reaching a state of renewal, where each day is a new adventure, is possible in your life. This is the beginning of a new-found creativity or desire to accomplish your dreams. The Fool indicates that anything is possible and that many opportunities are out there waiting for you to embrace them. But, there are choices to be made, and you can’t underestimate the importance of them. There are different options available to you and you must choose wisely. Hopefully you’ll have the Temperance card in your spread too, just to balance things out! If not, you can rest assured that The Fool believes in you to make the right decision. He encourages you to believe yourself as well and to trust in your decisions by trusting your own intuition. This is the time for you to believe in your dreams and even in fate itself, because the Universe is conspiring and your best interests are at its heart. In a nutshell, The Fool is telling you that you need a new beginning. This new journey will take you somewhere you‘ve never been before, and you may feel nervous or apprehensive. But don’t you worry: The Fool is all about new experiences, personal growth, expansion and adventure. The Fool himself is worry-free, this is where the innocence and sense of wonder comes in. He believes that everything will work out for the best. He likes not knowing the future, and he is confident that he will succeed. If you’re prone to having fears The Fool is an excellent card for you as helps build your courage, inspiring you to take risks. The Fool is one of the most powerful cards in the Tarot deck. While it usually represents a new beginning, it also indicates the end of something. His position in your spread reveals which aspects of your life is about to change. Approaching the changes with optimism and care will result in the best outcome. When The Fool card is in the Past position, it means that you’ve already led a life filled with risks and challenges. Your original thinking has brought you a lot of success. You’re a trailblazer, doing things your own way, on your own terms. The risks you have taken and your original thinking have brought you success. If you have The Fool card in your present it means you’re entering a new and exciting phase in your life. The experience at the core of this change can either be positive negative. Don’t worry too much about this, its influence will become clearer to you in the future. That said, you still need to assess the risks involved, so when you go to make a decision, make sure you’ve done the research. When The Fool features in your Future position it is warning you that if you want to succeed you’re going to have to change your methods. It’s time to find new ways to bring about the achievement of your goals. When opportunity knocks, you must be prepared to shed old habits. It also means creating new opportunities for yourself. The Fool reversed suggests that you are longing to be free, but your responsibilities and commitments are weighing you down. You feel trapped and make half-baked ideas to find a way out of it. When The Fool is reversed, you need to reign in spontaneity and freedom. His presence suggests that it’s time to grow up and face your duties regardless of how boring they are. The Fool card now represents a bit of a wake-up call and you’d better heed his warning! If not, you risk looking foolish! With the reversed Fool you need to take the time to make important decisions, this is not the time to trust in the Universe! Take out a pad of paper and a pen and really consider your options. As I’ve said before, Tarot card readings are very subjective and to truly get the clearest meanings out of the cards you need to know both Arcanas inside and out. If you don’t have the time to read up on this art, then call me so we can make a one on one appointment. Surely, if The Fool is visiting you through the Tarot spread, the Universe has a message for you. Aren’t you dying to find out what new adventures you have to look forward to?! I am! This entry was posted in Cards and Divination, Tarot and tagged fool card, fool tarot on November 24, 2014 by Mirella.